Ronnie came from 6-2 and 8-5 behind to beat Judd Trump by 10-9 – on the last black – in the first semi-final in Landudno yesterday. It was quite an extraordinary match, and one that took us fans on a rollercoaster! The first session ended with Ronnie trailing by 6-2, and I was glad that the match was played over 8 + 11 (possibly) because had it been 9 +10, I feared it would have gone 7-2. It wasn’t exactly a repeat of the Masters in January, Ronnie was playing better than he had then, but his long potting failed him and this meant that he was not able to create his own chances. Judd played confidently – he had beaten Ronnie in their last two finals – and he was dominating the match. Judd Trump has opened up a 6-2 advantage against Ronnie O’Sullivan in their semi-final clash at the Coral Tour Championship in Llandudno. The Ace in the Pack held all the cards this afternoon and requires just four more frames for victory, with O’Sullivan needing eight of the remaining 11 to be played. Last time the pair met was the Masters final in January, when Trump opened up a 7-1 first session lead and went on to claim a 10-4 victory. He will be hoping for a similar outcome this evening. 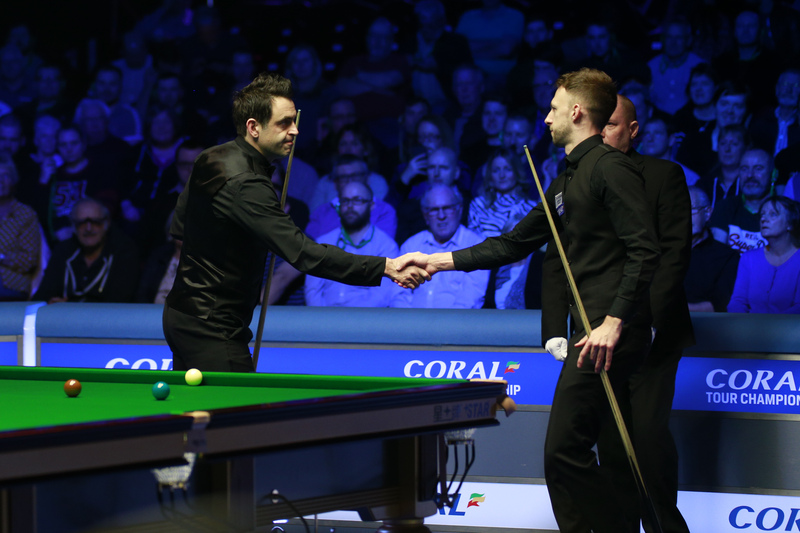 Trump and O’Sullivan jointly occupy the top of the Coral Cup Standings on £130,000, where the winner is derived from who earns the most prize money from the three Coral Series events. They hold the first two tournaments between them, with Trump having won the Coral World Grand Prix and O’Sullivan claiming the Coral Players Championship title. With Trump holding a 2-1 advantage this afternoon, he compiled a crucial 66 break to come from 46-8 down in the fourth frame and move 3-1 ahead at the mid-session. A further run of 55 helped him into a 4-1 lead when they returned. O’Sullivan responded with a century break of 100 to make it 4-2. However, it was Trump who claimed the remaining frames to secure his 6-2 lead going into tonight. The remainder of the best of 19 clash will be played out this evening at 7pm. One difference with the Masters final though was that Ronnie looked up for it, even at 6-2 down. I expected him to come back in the evening fighting. However winning looked highly unlikely. I was thinking “If he can make the score honourable, come back to 10-7 maybe, I’ll be happy”. When he won the first two frames after they resumed, I thought, OK, he might have a mini chance here … just. Ronnie O’Sullivan completed a sensational fightback by downing Judd Trump on the last black to win 10-9 and reach the final of the Coral Tour Championship in Llandudno. The deciding frame was packed with drama, as both players had opportunities to seal the match. Masters champion Trump was first in with a break of 50, before breaking down and allowing O’Sullivan back into the frame. Eventually it all came down to the colours, where Trump spurned a match ball yellow to the top right pocket. O’Sullivan then potted a sensational yellow and proceeded to clear and steal the match. He clinched it with a tough black along the bottom cushion, punching the air with delight after it dropped. The Rocket was never ahead until that very last ball. Victory means that O’Sullivan now edges in front in their head-to-head record, leading 11-10. It’s his first win of the season over Trump, who had defeated him in finals at the Northern Ireland Open and the Masters. The result now leaves O’Sullivan potentially just one match away from equalling Stephen Hendry’s record of 36 ranking event titles. If the five-time World Champion seals the trophy on Sunday, it would also see him move to world number one and end Mark Selby’s four-year reign at the top of the rankings. O’Sullivan and Trump came into today’s clash tied at the top of the Coral Cup standings on £130,000, which are derived from earns the most money from the three Coral Series events. Defeat this evening now forces Bristol’s Trump out of the running for top spot. The Ace in the Pack had led 6-2 after a sparkling first session of snooker this afternoon, but he was soon reeled in as the Rocket surged back into the tie. Breaks of 82 and 50 allowed O’Sullivan to immediately move back withing two at 6-4. There were then three consecutive frames which lasted over 30 minutes, as the game moved into a tactical phase. Trump emerged with an 8-5 advantage. The resilience of O’Sullivan then came to the fore as he claimed three on the bounce, including back-to-back century breaks of 130 and 134, to make it 8-8. 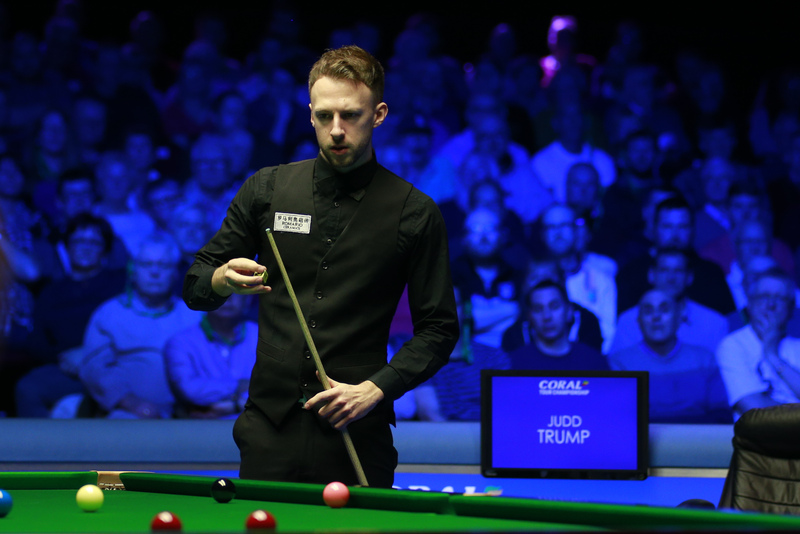 Trump was first to move one from victory thanks to a contribution of 61, before O’Sullivan levelled to set up the thrilling finale in which he clinched the tie. “I went out there with a different mindset tonight and I just felt relaxed. I was enjoying it and playing each frame and each ball as it came,” said O’Sullivan. “I didn’t even feel the drama. I know everyone was saying what a great match it was, but I didn’t really feel nervous at all. I just enjoyed it and once I got my mind right and played the balls on the table it was a different game from this afternoon. Ronnie’s reaction at the end of the match says it all. How much it mattered, how determined he is. Yesterday he was a picture of resilience, he was the big fighter. This defeat will hurt Judd Trump. 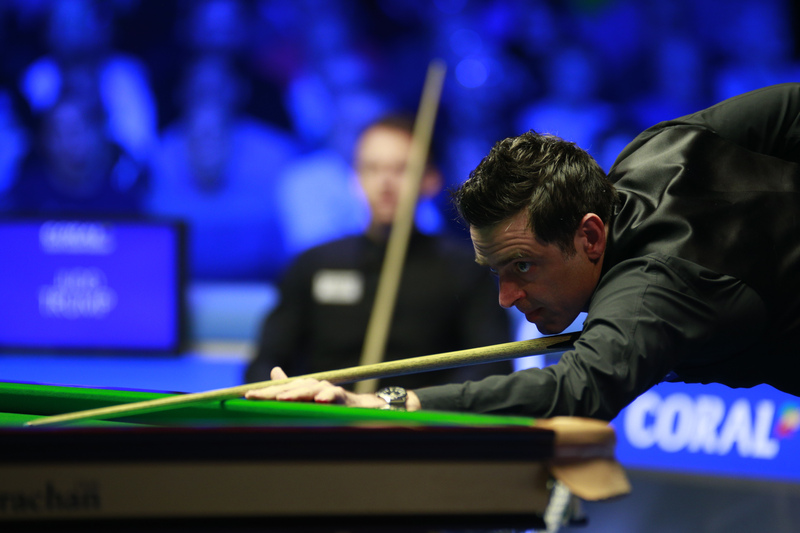 Winning on Sunday would put Ronnie on top of the rankings again, and he would go to the Crucible as world n°1 unless Mark Selby wins the China Open early April. This would be quite extraordinary considering that Ronnie has skipped a lot of events this season, including all of the very lucrative Chinese ranking ones. Should Mark Allen win tonight, Ronnie is guaranteed to go home with the Coral Cup on Sunday, whatever the outcome of the final. Neil Robertson can still overcome him if he wins on Sunday. Let me rephrase it then: I happen to be highly pleased about the fact that this not-so-spectacular individual has finally received a splendid beating. No doubt that Ronnie has won this match due his extraordinary mindset. He never lost his concentration and his will to fight until the end. I think it‘s one of his most important wins in terms of self confidence. He showed a great character and that resilience which he lacked on other occasions, even including the Masters final. And eventually he has dispelled the Trump curse.